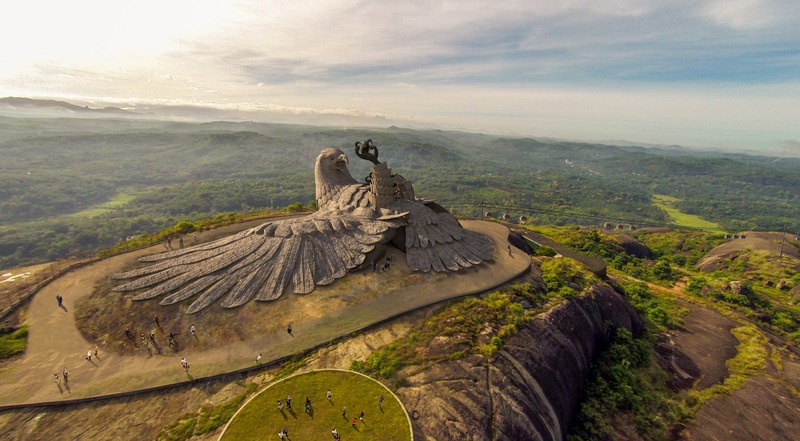 The huge statue of Jatayu is constructed on a vast rock named Jatayupara. The oversize statue is 200 ft. long, 150 ft. wide and 70 ft. in height making it the largest well-designed bird statue in the world. It holds the prestigious Guinness Book of World Records for its architecture. It has 15,000 sq. ft utility space inside this serviceable statue. An audio-visual museum and a multi-dimensional mini theater built inside this functional sculpture make it a destination worth to visit. Apart from that a temple dedicated to God Rama and its mythical markings in a fenced area on the top of the hill is an added religious attraction. Cable car service to go to the top of the rock is available. Total 16 cables cars which can accommodate 8 adults in each car. It takes approx 8 to 10 minute to reach the rock. If you are fully physically fit, you can trek to the top of the hill. It may take approx 1.5hrs to reach the top. Those who have knee, breathing and heart diseases should avoid this route. Heli-taxi from Trivandrum to Jatayu is available. Cable car charges Rs 250 per person. Entry fee Rs 150 per person. A classic example of sustainable tourism, Jatayupara is a delight to the eyes and is a crowd-pulling destination for adventure tourists.